You know what? 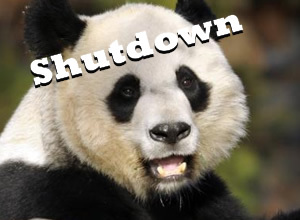 There is a silver lining to this whole government shutdown kerfuffle. Notwithstanding all the bother & inconvenience (& loss of PandaCam), it provides perfect insight into the inter-relatedness of the key elements of Web Governance. As we know, Web Governance is composed of 4 primary activities supported by 4 pillar resources. The 4 activities are Leadership, Development, Maintenance & Infrastructure. The aim of these activities is to deliver a minimum standard of online experience. The 4 resources are People, Processes, Tools & Budget. These resources are needed to ensure the above activities can happen. The bigger the 'scale' of your site, the more granular & sophisticated these two elements become. For example, as online activity grows so too do the number of people needed on your team, the complexity of supporting technology, the complexity of procedures - and the budget needed to fund it all. However, the curious thing is that even as such investment grows, the less resilient your operations can become overall. For example, take the small-scale website of a local college or business. Such a site may be looked after by a single person with a broad-set of skills using freeware tools & informal processes. This web-gal/guy is typically very inventive about how they do things. Their budget is so vanishingly small, they have to be! In many ways, their greatest strength is how easily they can operate on a shoe-string. When things go awry (i.e. when money is tight), they are often able to find a way to keep the show on the road. At the other end of the spectrum, we have the very large-scale operations of a federal agency. Such a site is so complex that lots of people with highly specialist skills are needed to look after it. Everyone uses sophisticated tools and follows documented processes. In addition, everything - from salaries, to technology to ongoing development - has a formal budget allocation. In this case, when things go wrong (i.e. when the money dries up) the complexity of the operation is such that nothing can continue. There is simply no way that such a sophisticated site can remain active - even for short periods - without the backing of essential resources, particularly budget! Which is why the government shutdown is such a lesson in Web Governance. Managing a large-scale site requires confidence that essential resources will always be in place. Take any of them away and you'll find out just how quickly things can grind to a halt! An interesting consideration is what to do when things do go wrong. Has NASA, the USDA & others taken the right approach by completely removing their websites? Could they have copied the Smithsonian, by leaving most content online but posting a message that some operations will not be attended to, e.g. feedback, etc? In a way, I admire the 'purist' approach. It sends a stark message ... "Get real. You can't expect me to manage this incredibly complex operation with no cash! I am shutting it down. It's either all or nothing. No shortcuts." Of course, it depends on the complexity of the operation, but I would probably be more inclined to the Smithsonian approach. Leave a core of essential information online (that requires little management) and pull everything else. Maybe this governmental mess suggests we should all have such a core-site in our backpockets for future deployment 'just in case'?